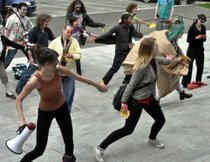 OLYMPIA, Wash. – As the House of Representatives voted to reduce and rearrange a key welfare program May 13, demonstrators dressed as zombies marched on the Capitol to protest budget cuts. Maybe shuffled is a better description. Zombies don’t march well, what with their arms outstretched and their stiff-legged gate. The protesters did manage a flash mob dance, reworking the words of “The Monster Mash” to “The Monster Slash,” which they performed outside the Capitol on the north steps, and later in the rotunda on stairs leading to the House chamber. Heather Duke – an Olympia resident who described herself as a small-business owner recently forced into bankruptcy, a mental health advocate and a professional clown – said she usually avoids protests but joined this one because it was more creative than most. She put white makeup on her face, drew black circles around her eyes and drew in some blood-red splotches in an effort to get noticed amid the crowd of “well-paid lobbyists” who normally work the legislative halls. “I hope this type of action will spur people on,” Duke said. The House, back from two days of recess, spent much of Friday in caucus but in the afternoon passed several bills, including major changes to the Disability Lifeline. That program, called General Assistance-Unemployable until last year when the Legislature revamped it, provides health insurance and cash payments to disabled persons ineligible for other programs. The bill approved by the House would change the name again, splitting Disability Lifeline to focus on different groups of disabled people. It would offer health care to most, but cash payments only to people who would eventually become eligible for a federal program, Supplemental Security Income, and the federal government will reimburse the state for those payments. Other disabled people in the new system would receive vouchers for housing from money the state would give to the counties to set up local low-income housing programs. Rep. Gary Alexander, R-Olympia, said the changes were inadequate: “We keep changing the name but we don’t address the underlying problem.” The Senate may be sending them a better plan later, he added. The changes passed 53-36 on a party-line vote and the House adjourned shortly before some three dozen “zombies” arrived from a nearby park where they’d put on their makeup and grabbed signs before shuffling to the Capitol.